The new education focused device will reportedly be priced to match the iPad and will even include USB-C. Following the release of Apple's latest iPad geared at the education sector, Microsoft is reportedly planning to release a new line of lower-cost Surface tablets as early as the second half of 2018, according to those familiar with the matter. The tech giant unsuccessfully tried this before back in 2012 with the release of the original Surface RT. When the tablet launched it retailed for $499 which made it difficult for consumers to justify the price as the device ran a dumbed-down version of Windows. Microsoft then pivoted to the more-expensive Surface Pro line which offered better performance and more features. The company's new tablets will take inspiration from the Surface Pro but will sport a smaller 10-inch screen with rounded edges to make them more accessible. Microsoft has also apparently decided to include USB-C connectivity for the first time on a Surface device. The new line is also expected to be about 20 per cent lighter than the current Surface models but will have its battery life cut by four hours. Intel will be supplying the main processor and graphics chips for the new model just as it has on previous Surface devices. As for storage and connectivity, Microsoft is planning multiple models with 64GB and 128GB of storage as well as models with the ability to connect to LTE cellular networks. As it has done previously, the company will not include the keyboard with the device though it is apparently working on a cheaper version to accompany the new model. Microsoft's Surface line has proven that Microsoft is more than capable of making its own devices that rival Apple in design and performance. 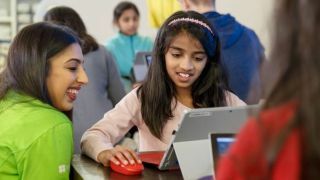 A lower-cost Surface geared towards education will allow it to build even more awareness of its brand while taking on Apple's similarly priced educational offerings as well as Google's less expensive Chromebooks.